entire loan available to students – if you are eligible for the full amount. Yet six years ago, the picture was almost entirely different. In this time, rent has increased by an average of almost 56% – students are paying an average of £2484.94 more per year, and the cheapest room at UCL has increased by more than £40 weekly, from £94.01 per week. since 2009, and student income has only increased by 12% to 16%, depending on income bands. Alongside this, UCL will be running a surplus of £15,779,000 from accommodation during this academic year, enough to fund a rent cut of almost 45% without affecting the running of halls. Winning affordable rent requires action! Last year we organised a tent protest to highlight rising rent costs and demand an end to the increases. We as students of UCL have decided that enough is enough – UCL cannot continue to raise the rent in halls as it wishes, ignoring the rapidly decreasing level of affordability. Living in halls now is almost impossible without financial assistance on top of your student loan and maintenance grant (including the UCL bursary!). UCL cannot pretend to offer equal opportunities to students from all sections of society when the sky-high cost of living constitutes an unofficial entry requirement based on your financial position. 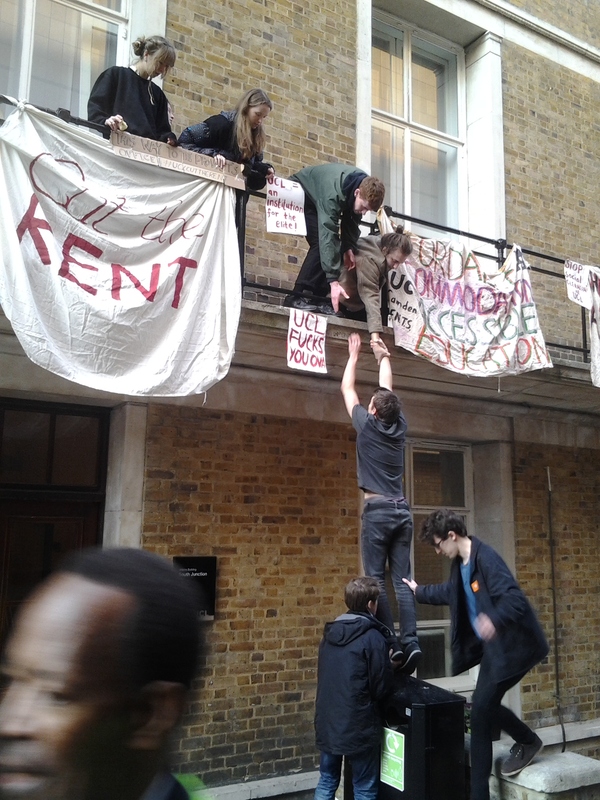 Occupying the Provost’s balcony to highlight UCL’s unaffordable rents and tell the Provost what we think about them! Asking nicely won’t make UCL accommodation affordable – your help is required to run the campaign to hold UCL to account. Campaigns also involve a lot of communication, logistics and and letter-writing – that’s part of how the Hawkridge House rent strike was won. Meet others who share your belief in freedom, justice and fair rent. The Campaign meeting is a great place to start! Halls Assemblies are meetings at your hall where residents get together to decide for themselves how they would like their halls to be run. This is real democracy in practice – students making decisions for themselves about what changes they’d like see. This is an opportunity to unite with others in your hall around common issues and agree on how to improve anything from cockroaches to the lack of halls parties. Halls Assemblies can also be for making decisions about collective action such as writing letters to management and protesting poor maintenance and high rent. Many of the rules and conditions that UCL enforces are unfair – Halls Assemblies are where you and everybody else in your halls decide what to do about them. Keep an eye out for your first local assembly. Anybody can call an assembly, so if you can’t find one scheduled for your halls you can establish one! Contact your Union Halls Officers to find out more details or help to organise a meeting. A Halls Assembly meeting in the Max Rayne House common room. 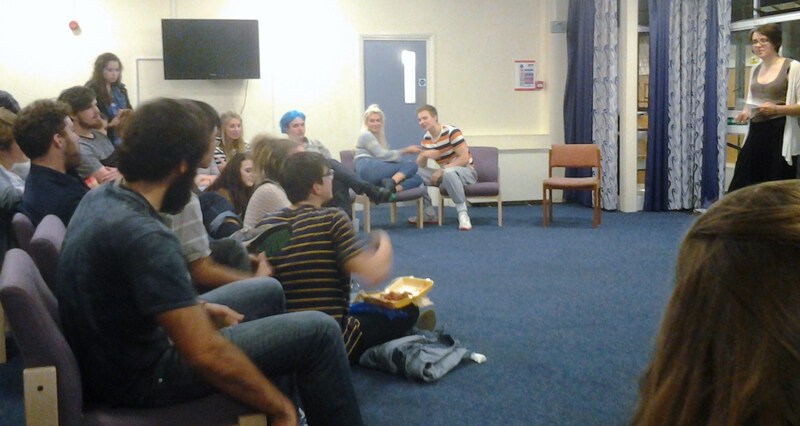 Residents decided to demand better furniture and kitchens, and set up a halls committee to organise parties and events! Each hall at UCL should have a union halls rep and a residents’ committee. These are students who are elected to raise issues with UCL management, stay up to date with problems around your site and take on organising work for actions meeting, events and parties. Being a representative in the students union or on a committee is an important and rewarding job and a great way to meet and speak to others at your halls, find out what their problems are and meet with the bosses to demand that they get solved. UCL also gives a budget to halls that have a residents’ committee (£5 per resident, or between £1,000 to £4,500 per hall) – this money can be used for social events, parties, equipment for the common room or anything else residents decide. Union reps can also get the opportunity to bring issues faced by their constituents to meetings with other union officers, union general assemblies or meetings with UCL management. If you’re proactive and like getting involved and solving problems and issues for fairer halls, you should stand for election! To join the election to be a union halls representative just follow this link: www.uclu.org/election/autumn-elections-2015 If you want to be part of your halls committee, write to the Union Halls Accommodation Officer and to your local site managers. Nominations for union representative close on Friday 9 October – so make sure to register on time! UCLU is our students union. Becoming a representative is simple, click the picture for more information. If you experience things in your flat that you think should be improved (Lower rent, no pests, better kitchens, or anything else), don’t keep it to yourself! Chances are that others in your flat, your block or your halls will be experiencing the same problem. Don’t feel that you’re not entitled to make complaints to UCL management or demand better. Talk to other people in your flats and in your halls, follow what’s going on on your halls facebook page or ask others if they’ve had the same problems. Find out what issues are around and decide how you’d like to see it fixed. Nobody likes pests! Is your fridge too small? Would you like to spend less money on rent? – Don’t accept poor conditions, and if you stand up for your flatmates’ problems you can count on them standing up for you. Make sure to let UCL know what you want. Also make sure that you’re not alone in proposing improvements; remember – unity is strength. The more people who’re demanding change the more likely it is that management will be forced to take you seriously. UCL are experts at ignoring individual complaints and often dismiss students who write to them with. But when we get together me can make them listen – it’s thanks to collective strength and bargaining power that the ‘Cut the Rent’ Campaign has been able to win concessions in the past. Remember that you can always turn individual issues into collective disputes. If one of your flatmates has a broken window, you can speak up on their behalf and vice versa. Set up petitions and collect names of everybody who wants to see better conditions and lower rent. Know who to contact at UCL and report service failures (report issues here) as soon as possible. If you don’t get a satisfactory response from your local site managers, write to their bosses. Don’t hesitate to send complaints or petitions to the Director of Student Accommodation (w.wilson@ucl.ac.uk) or the Head of Property (c.plank@ucl.ac.uk). Always contact your Union Halls Officers for advice and assistance. 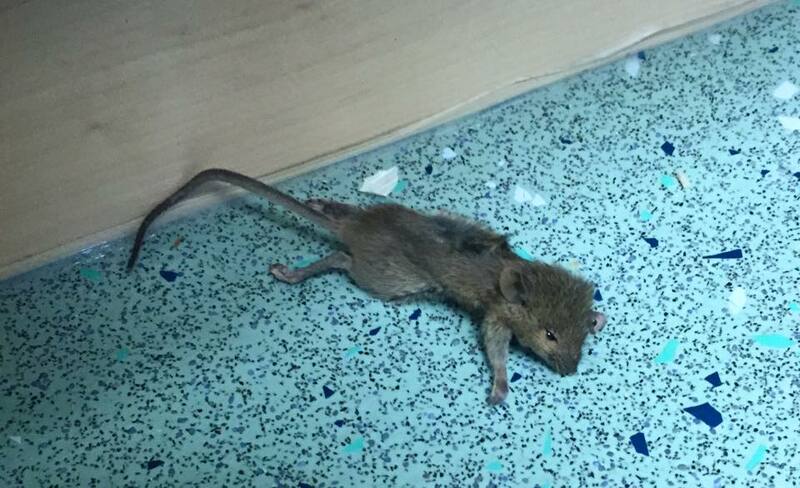 A dirty dead rodent found in a kitchen in UCL’s Hawkridge House. Nobody should accept pests like this and at Hawkridge over 100 people signed a protest letter to management for better conditions. 6. Get your flatmates involved! The more people are involved in the campaign for lower rent the more likely we are to succeed! Talk to your flatmates and others in your halls. Get them to come down to the next campaign meeting or Halls Assembly, and take part in a protest action. It’s our right to have decent and affordable homes – in a city beset by a housing crisis that’s hitting not only students, this is something that concerns everybody! Lower rent at UCL will help break the power of the landlords across London, but it will only happen if we get out mates to get on board too. Remember that this is a struggle we can win if we stand together. 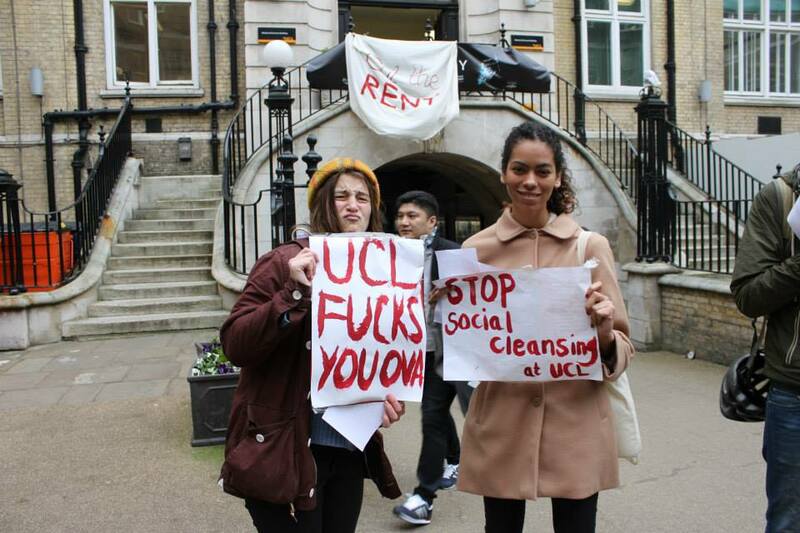 Contact the ‘UCL, Cut the Rent’ Campaign here. 06/10/15: 17:00 – Jeremy Corbyn: What Next For The Left? In this year’s first UCL Left Forum meeting, we will try to answer the questions: what does Corbyn’s victory mean and what happens now and how can we make sure that all the people who are excited about left politics stay mobilized and militant? Afterwards, we’ll decamp to the UCLU Labour social! This meeting will focus on how a rent cut can be won – building on what has been learnt from the campaign last year and the successful action taken by the students protesting in Hawkridge House and Campbell House – and planning exactly the steps that will be taken in order to build an effective campaign from the residents in the halls upwards. The new Tory government is planning brutal attacks on students and education. They want to take maintenance grants away from the poorest students, hike up repayments on loans we’ve already taken out, and marketise universities while slashing funding for colleges – not to mention dismantling the wider welfare state while a cost of living crisis enforces rip-off rents. But if we fight back together, we can beat them! UCL Defend Education is part of a movement campaigning to stop these attacks, and to win free, democratic education for everyone. Come along to find out more about activism at UCL, and engage in the debate over education, the priorities of society and what we as students can do about all this. If you’re interested in lefty political ideas, crazy things such as reducing inequality, saving the environment and fighting cuts to public services, or if you’re just a bit weirded out by what David Cameron did during his time at university, come for a relaxed evening and a chat about politics and campaigns on and off campus. No background knowledge is required – we won’t be giving you a test or make you argue with someone over their interpretation of the twenty-fourth page of the Communist Manifesto. Probably best not to come if you’re a Tory, though. Have a soft or not soft drink and talk about stuff – and don’t worry, we’re nice people. This meeting will explain “WTF is going on?”, with help from speakers involved in the National Campaign Against Fees and Cuts and the National Union of Students, and discuss ideas about what we can do to get involved in the fight for education. From scrapping Maintenance Grants, planning to raise tuition fees, slashing support for disabled students and making brutal funding cuts to Adult & Further Education; to keeping thousands of people locked up in detention centres and deporting international students to their deaths: the Conservative Government is attacking us from all sides, and it’s time to fight back. Over 1000 staff and students signed out petition for a rent cut in a week! Whilst the main focus is a university-wide rent cut, it is important not to overlook the small victories that the campaign has won. So here are just a few things we have achieved over the past year that have improved conditions for UCL students in halls. Organising protest actions at Hawkridge House meant that students who had been ignored by management for months over terrible living conditions caused by construction work and pests ensured that over 200 people there won a £132 compensation payment from UCL. Management didn’t give it freely, though. 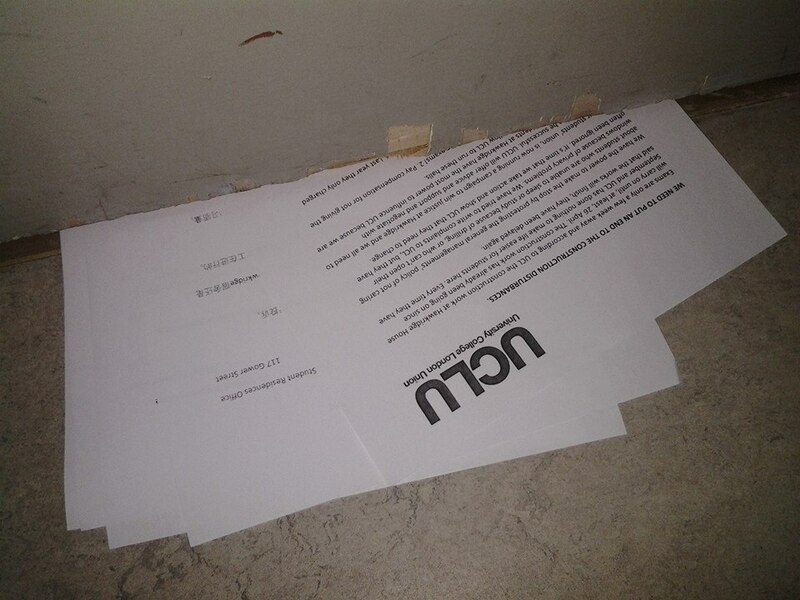 First we needed to assemble a large number of complaint letters after which residents threatened to not pay their rent if there weren’t given a fair deal. But thanks to our efforts, it worked! This was the first win of the campaign and it came after we exposed the state of UCL’s most run-down halls. It may not sound as big as hundreds of pounds of compensation, but it did have a significant impact on the common room – and it was a vast improvement on the way things were before we demanded better conditions. The new couches and pool table meant that people actually wanted to hang out in the common room and improved the social dynamic of the entire hall. Again, this was not something that management wanted to give to us by themselves. We had to demand it! For much of the beginning of last year, there were no accessible toilets by the basement common room at Ramsay Hall. As Ramsay is a popular party hall, this meant that wheelchair-users were not able to visit or join parties and use the toilet without a very undignified process of leaving to use one much further away that was accessible. Following our demands for improvement, there are now two accessible toilets by the common room. During the dispute at Hawkridge House and Campbell House UCL threatened students, who were withholding rent payments in protest over the state of their halls, by saying that they would not be allowed to re-enrol on their courses. Threats and sanctions like these were deemed illegal by the Office of Fair Trading in 2014. It turned out that UCL were still using these threats against all students who were unable to pay for their accommodation in time. Our campaign forced management to backtrack on their threats and to stop using such illegal actions against students rather then negotiate with us. Residents at Campbell House were unable to study for their exams because of UCL’s demolition works on Gordon Street, just behind their bedroom windows! They protested by refusing to pay rent! At the final meeting of the year between UCL Provost Michael Arthur and the UCLU Sabbatical Officers it was revealed that he would invest more funding into improving halls. After a year’s campaigning this meant that the top levels of management are finally beginning to shift under out pressure. Obviously, the Provost’s words doesn’t mean much. We shouldn’t celebrate until we see the funding go into improvements for students. UCL is infamous for not keeping it’s pledges in the past, to pay the London Living Wage to all it’s staff, for instance (spoiler – it still doesn’t!). If anything, this means that we need to keep up our pressure more then ever to make sure that, a: UCL live up to this pledge, b: they don’t make students pay more for the improved conditions, and c: they cut the rent! – In other words, there is a lot of work ahead! Moneybags Michael Arthur has a £360K salary. Cut his pay instead of raising the rent! We’re looking forward to winning more improvements at UCL over the next year. Our campaign is completely student-run and everybody is welcome to join in and help us make sure that rents at UCL become affordable (as long as they aren’t bosses). If you’d like to be part of the action for a better and fairer UCL, don’t miss the first campaign meeting of the term on 7 October! (Event page here) See you there! 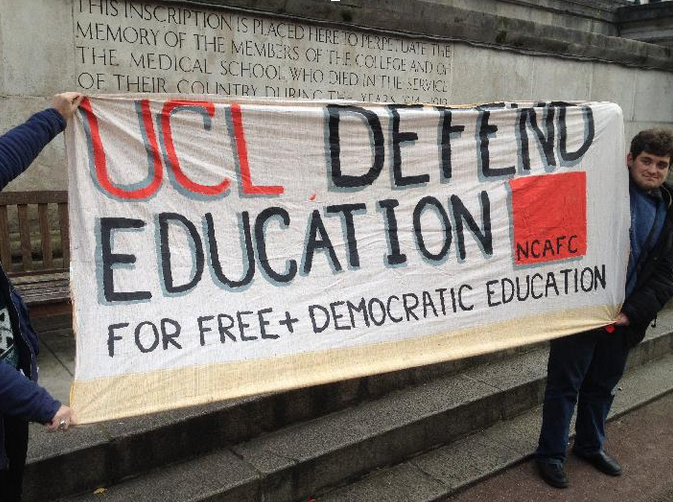 Who Are UCL Defend Education? We’re a group based at UCL, campaigning for free, funded, accessible education, and for social justice and freedom more broadly. We want UCL and other educational institutions to be liberatory and democratic, not tied to serving the interests of business and the government, and we fight for decent conditions for both students and education workers. We resist cuts, marketization and privatisation, not only in education but other public services, and we oppose sexism, racism, homophobia, transphobia and disablism. 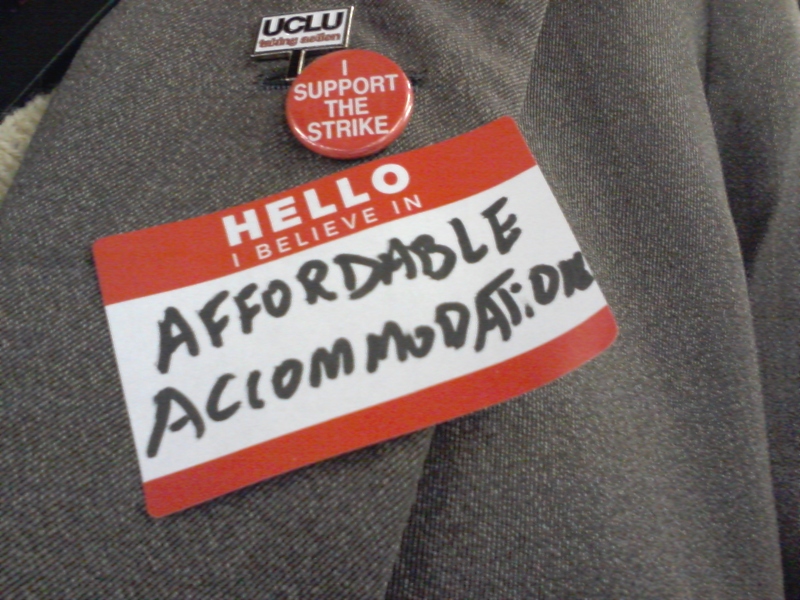 Our group came out of 2010’s mass occupations and protests against tuition fee increases. Since then, we’ve helped Stratford residents defeat our university’s attempt to bulldoze their homes, played our part in the national campaign that halted the privatisation of student debt, supported campus workers striking for decent pay, and more. We are part of a democratic network of student activists across the country through our affiliation to the National Campaign Against Fees & Cuts. We are a democratic, open group for anyone who agrees with these goals. We meet weekly at 6pm on Mondays. Come and get involved!